is the Shuttle to scale? if so, wow. it looks like knurled brass plate back there, with a patina to it too. The shuttle is to scale and that was done for that "wow" factor. It looks beautiful, but it's not something I'd purchase. 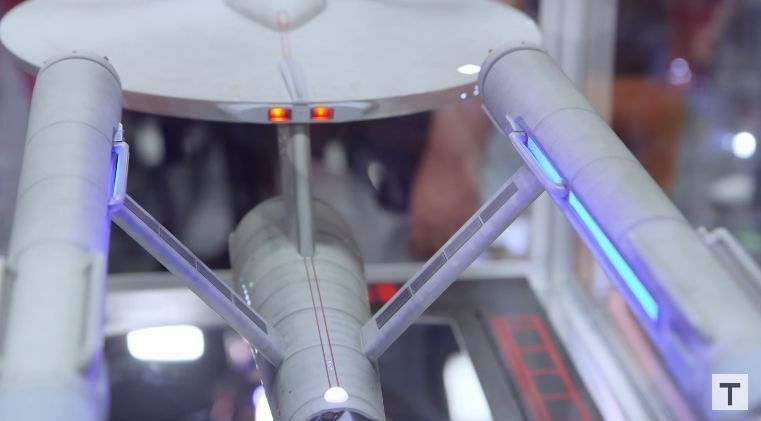 Personally, I prefer my TOS Enterprise with non-glowing nacelles and un-Azteced. I know a lot of folks liked the remastered versions, but it just doesn't look the way it did to me when I was a kid. I guess I'm stuck with the original 1960's vintage version, because that looks "right". 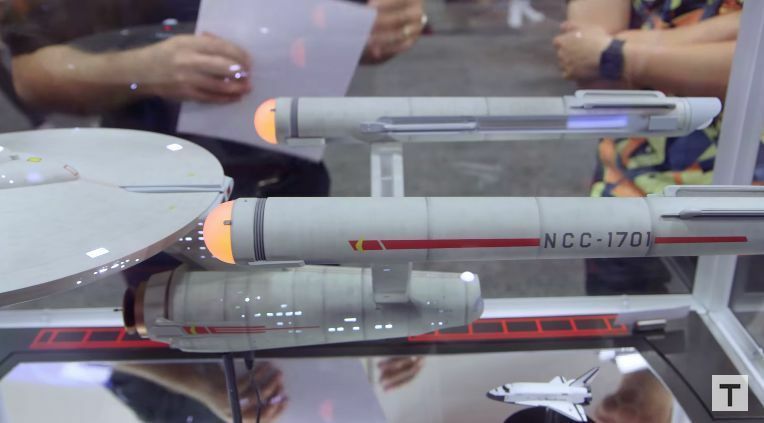 Make the nacelles glow all you want, and put Aztec all over it. Just don't call it the Enterprise. The original filmed model did have glow-y nacelles - they were red light (grain of wheat bulb), with a big marble in between which caused that scattering effect (which looked like a lava-lamp) - there's a big difference in the filming quality between the as-aired and the archival tapes. As aired, it looks a little more faded and static. 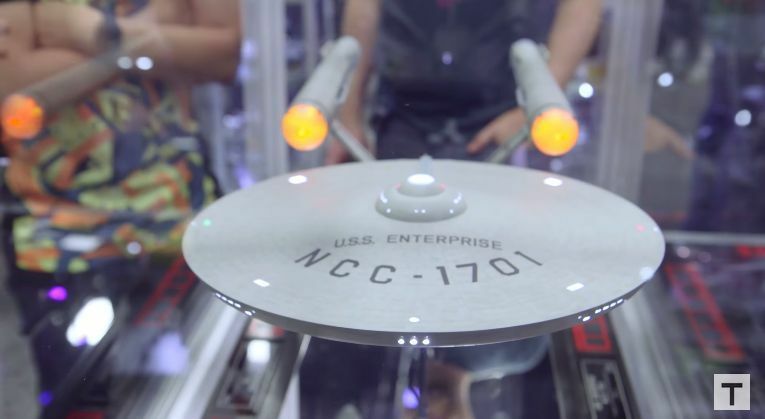 So, it's probably based on "ST:ENT these are the voyages" or TOS-R.
What did you think about that knurled brass finish they've achieved on the deflector though? Well I like it. I see exactly the 'if they didnt have to cheep out on the filming model' angle. I see people say 'its not what I seen on TV as a kid'. I remember white and not alot of detail. Not what the filming model looks like... but what it looked like on TV. They have added detail without hurting the look and feel of the original. It now looks like something I could see having anything in common with the refit connie other than vague shape. Imagine they kept the old TOS design and increased the detail level for the movies... this is what you would have got. TOS with TMP detailing. I like the glowing warp grills. Not a fan of azteking on any ship, least of all the original 'Prise. I see they put in the Trials and Tribblations skylight at the front of the saucer. 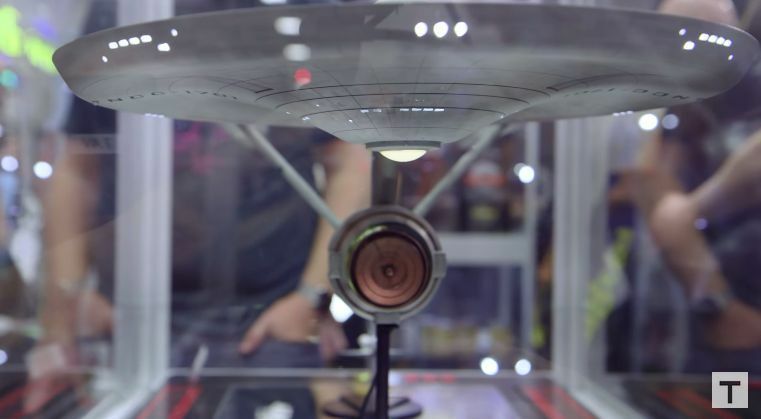 With all the research I've heard these guys claim they did, you'd think they'd know that was caused by a missing plug on the original 11 foot filming model, when the production crew was doing their research for the DS9 filming model. It is too much for my taste. I'll always feel bugged whenever I look at an "enhanced" TOS prise. It simply doesn't look right. 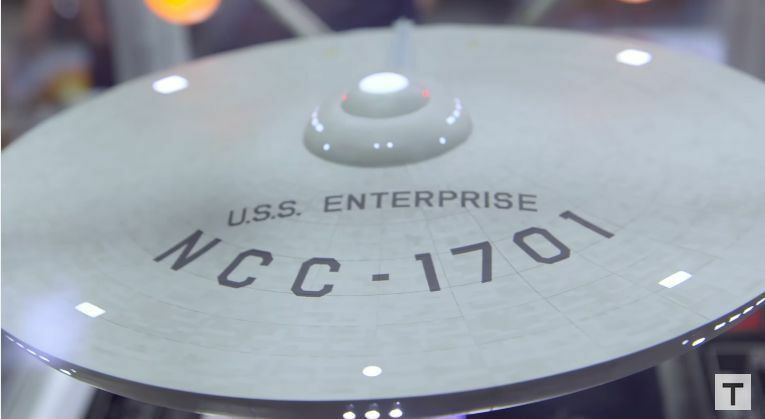 The good old beloved Enterprise is cool as she is. She doesn't need any extra bell or whistle. Just leave her alone.